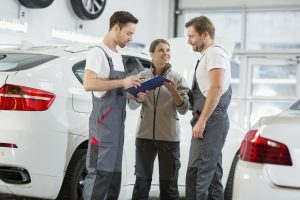 During the holiday season, it can be difficult to stay on top of vehicle maintenance, but once you’ve had some downtime after New Year’s, it’s important to take your vehicle in for inspection, especially if you traveled to visit relatives during the holidays. Here’s a vehicle service checklist to help you to know where to start. Battery and Charging System: Cooler temperatures reduce battery capacity, so your battery is more likely to die in the colder months. Check battery connections, the charging system, and the charge of the battery itself. Drive Belts and Hoses: Old engine belts will wear, crack, and snap over time, which could cause incredible amounts of engine damage. Hoses are important, too, for keeping your engine cool with anti-freeze. Tire Pressure: Like batteries, tire pressure is negatively affected by low temperatures. Colder air makes tires lose their pressure faster, so make sure your tires are properly inflated. Heating, Ventilating, and Air Conditioning: The HVAC system is crucial to defrosting and staying warm in the winter. Brakes: Brakes should always be in good working order, especially if you expose your vehicle to slick road conditions or hazardous weather. Keep up with this vehicle service checklist after the holidays to make sure your car is ready to face the cold temperatures that January and February bring to the table.